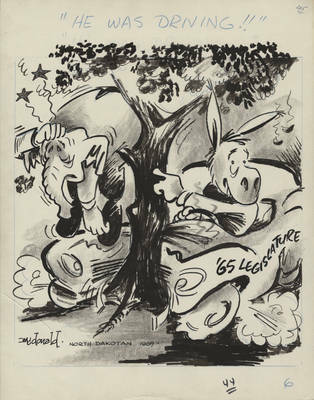 Cartoon depicts the Democratic donkey, behind the wheel of an automobile, "65 Legislature," wrapped around a tree pointing to the Republican elephant, who is ejected from the automobile into a tree branch. The 1965 legislative session failed in finding a solution to the tax referendum submitted by Robert P. McCarney. North Dakota voters defeated the tax package in a referral election on September 21, 1965. The reapportionment bill passed by the legislature is also being challenged in a lawsuit.